Paul Frankenburger was born in Munich in 1897 and after a successful career with the Augsburg Opera fled Nazi Germany to Israel where he changed his surname to ‘son of Heinrich’. In 1945, the Nazi menace defeated, he set about work on his four-movement second symphony. The first movement is said to be monothematic, but the very varied orchestration gives the impression of thematic transformation. At one point I heard a brief but distinct resemblance to the Ritual Fire Dance, but have been unable to relate that impression to the statement on woodwind of the opening theme at the outset. The orchestration is colourful, with percussion to the fore much of the time – the powerful central climax is exciting without being overblown. It is followed by the most individual of the movements – a scherzo – a setting of a popular song that Ben-Haim arranged, but as a listener unfamiliar with the song I was hard put to recognise that fact because of the composer’s use of pizzicato on the upper and lower strings almost throughout. This is supplemented by a brief outburst on the woodwind and percussion. Only in the very brief trio section does the music become more cantabile. The whole effect is striking. The slow movement is tragic, expressing the horror felt in the small Jewish community in Palestine when the full story of the Holocaust reached them. Ben-Haim’s sister was a victim. Unlike the first movement, the last has three motifs, opening with a powerful statement influenced by the finale of Beethoven’s 9th. It is followed by a light, dance-like section which is eventually combined with the opening into a fugue. The opening motif of the first movement is then brought back and is worked up into an excited and optimistic sounding finale. The other work on the disc is the Concerto Grosso of 1931 which, at just over 28 minutes, is a substantial, highly romantic piece, and as it happens, was the composer’s first orchestral work. It opens with a dramatic, almost cinematic theme in the form of a sarabande, underlying which is a drum motif that plays a repeated role as the work progresses. This is followed by the slow working-up of a fugue which gradually finishes the movement in triumph. The second movement opens with soft drumbeats followed after a few bars by a flute playing a long melodic line, gradually joined by other woodwinds, leading to a notable climax involving most of the orchestra. The music then starts a modified recapitulation of the flute theme which, after much working out in a beautifully lyrical, often gentle manner, gradually dies away. It is a movement of much emotion, but that emotion is not overdone, rather it impacts the listener by its solemn depth rather than its towering height. As in the first movement, the drum underpins much of the playing, its soft taps adding to the emotional undertow. I am impressed by this piece more than I have been by any music introduced to me in quite some time. The last movement is a passacaglia, starting with hieratic calls on the brass. The remaining instruments gradually join in as the movement progresses as a series of variations, slowly gaining potency until the opening motif of the first movement is encountered in full orchestration. 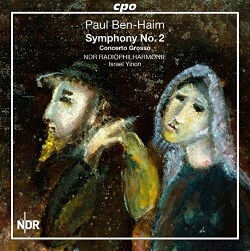 This is an excellent CD from CPO – the recording is spectacular, the performance fiery and committed, and the booklet readable and informative, and last but not least, the music is vividly approachable without falling into the ‘easy listening’ category. It is strongly, no, urgently recommended to all who like to explore unfamiliar, late romantic music.